This case was provided by a reader; there are missing details, but I believe it is still instructive. A male in his 40s had onset of pre-syncope during moderate exercise. On arrival in the ED he was cyanotic and drowsy. The monitor showed a wide complex tachycardia. Electrical cardioversion at 120 J had no response, but then he spontaneously converted to sinus rhythm. After being given a bolus of amiodarone, he was admitted. Further review of past history revealed a remote episode of Polymorphic VT due to a presumptive diagnosis of Catecholaminergic Polymorphic VT due to an abnormal ryanodine receptor. He had been managed with Nadolol and an AICD. There was no relevant family history. The patient had always been otherwise healthy, and had always enjoyed exercise. In the more recent past, he had also had an internal shock once during exercise. When the AICD was interrogated, it turned out to be due to sinus tachycardia, and so the acceptable heart rate limit was increased from 150 bpm to 188 bpm. The hospital course was benign. He remained stable and was discharged on flecainide, with a follow up stress planned. This was in the plan: "The ICD therapy zone will not be lowered at this time because of concerns that ICD shocks in someone with CPVT could lead to high adrenergic response and trigger VT storm." After moderate exercise, he presented in acute distress at a heart rate of 180, but with fewer perfused beats. Wide complex tachycardia. This is mostly monomorphic VT, but because V5 shows 2 narrow beats (which could be mistaken for fusion beats), this is polymorphic VT due to short episodes of bidirectional ventricular tachycardia. Notice these beats do not occur while V2 and V3 are being recorded, unlike the next ECG. Here again we see Bidirectional Tachycardia, and it is more obvious because it occurs during the recording of V2 and V3, which show it more clearly than any lead except V5 (across the bottom), which is by far the most diagnostic. He underwent synchronized cardioversion twice at 120 and 200 J with no response. He maintained a wide complex tachycardia with a heart rate on the monitor up to 180, but with fewer perfused beats. He remained alert. He was given metoprolol 15 mg IV with no response. (Comment: I would consider this a small dose, and would give esmolol which is short acting and can be dialed up and stopped if there are adverse events). In order to diminish the catecholamine surge thought to be driving his tachycardia, the patient was intubated and sedated with propofol. This failed. Overdrive pacing was attempted via his implanted pacemaker, and this also failed. The rhythm was then managed with amiodarone (this failed). He was given esmolol (this also failed). Finally, he was given verapamil. Following verapamil, the patient became very hypotensive until he became ashen and pulseless. Chest compressions were started and he was defibrillated again at 200J, resulting in restoration of sinus rhythm at 30-40 bpm, with inadequate perfusion. Atropine and pacing were instituted. The patient stabilized, and he was able to be transferred out of the ED. After a week in the hospital, he was discharged on amiodarone and nadolol after a benign stress test. Flecainide was discontinued. There was consideration of future sympathetic denervation of the heart. CPVT is one of the types of VT that occurs in a structually normal heart. It is due to rare mutations (either inherited or spontaneous) of either the ryanodine receptor gene or the calsequestrin 2 gene. Both in turn affect diastolic calcium release from the sarcoplasmic reticulum, and thus increase intracellular calcium levels (just as digoxin does), leading to delayed afterdepolarizations and triggered activity. Just as with Digoxin, one of the primary dysrhythmias is Bidirectional Tachycardia. PMVT is characterized by episodic syncope during strenuous exercise or acute emotion in people without structural cardiac abnormalities. It produces polymorphic VT, often with bidirectional VT, and can be well tolerated. As mentioned above, some CPV are linked to mutations in the cardiac ryanodine receptor, also called the cardiac sarcoplasmic calcium release channel (which mediates the release of calcium from the sarcoplasmic reticulum, required for myocardial contraction). Catecholamines can cause these ryanodine related channels to "leak" calcium in diastole and can trigger life threatening arrhythmias. The mean age of onset is 7-12 years, so this is initially a pediatric problem. However, onset may be as late as 40 years. The first manifestation may be cardiac arrest. The baseline ECG is normal. There are multiple mechanisms involved, including re-entry and delayed afterdepolarizations due to calcium overload or changes in autonomic tone. It generally cannot be induced in the EP lab. 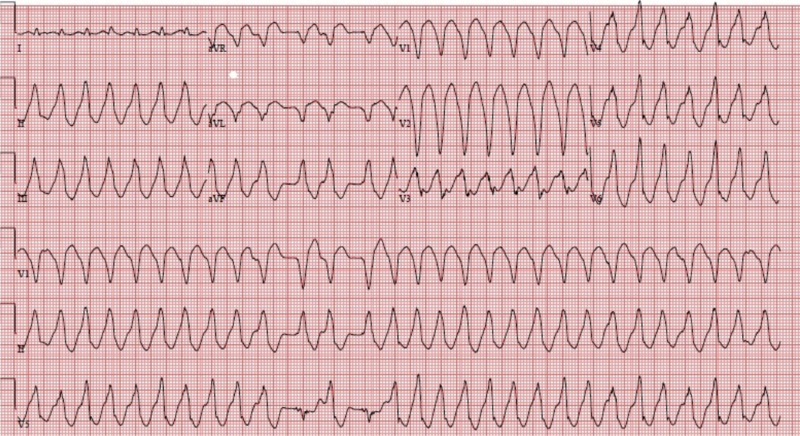 VT is of polymorphic morphology or of bidirectional morphology, such as one sees in digoxin or aconite toxicity, with alternating QRS axis, or alternating LBBB/RBBB. Further discussion is beyond the scope of this blog, except for emergent, and a bit on chronic, management. If it is a child with his/her first presentation, you may be presented only with polymorphic VT of unknown etiology. If you can record an ECG in sinus, and there is a long QT, then you will know that it is not PMVT. If you do not have that opportunity to record it, you will not know, but long QT is far more common than PMVT. By the time of adulthood, the patient will probably be aware of the condition. This is important, because the management of the two entities is very different. 1. If there is a long QT, then the polymorphic VT is Torsade. 2. If there is ischemia or evidence of cardiomyopathy on the ECG, then it is polymorphic VT due to ischemia or a structurally abnormal heart. Here is a post on the management of Polymorphic VT NOT due to CPVT. 3. If the QRST is normal when in sinus, then strongly consider CPVT. Or perhaps, as in this case, the patient is known to have CPVT. 1. Cardioversion or defibrillation (depending on presence of pulses), but with beta blocker pre-treatment (if possible), as the shock itself can cause catecholamine surge, further aggravating the situation and causing early recurrence of VT.
2. Intravenous beta blockers should be administered. Esmolol is a great choice, as it has a very short half-life and can be turned off if there are complications. Dose: Esmolol can be given in a bolus of 500 mcg/kg (0.50 mg/kg), followed by a drip of 50 mcg/kg/min (0.05 mg/kg/min). It can be rebolused repeatedly, as needed, each time increasing the infusion by 50 mcg/kg/min. 3. For recurrent VT in the absence of prolonged QT, amiodarone should be administered by bolus and drip. Amiodarone has beta-blocking effects. 4. Verapamil is recommended based on studies in which it prevents exercise-induced PMVT (3, 4). However, I haven't found literature on its use in the acute situation. Our electrophysiologist wrote that he would try it. In this case, it appears to have made things worse, but that is the problem with isolated cases without control groups. 4. Sedation, as in this case, to decrease sympathetic drive? Or, class IIb in ACC/AHA guidelines for incessant VT is general anesthesia. Avoid isoproterenol and overdrive pacing. For polymorphic VT due to acquired long QT (Torsade de Pointe), isoproterenol is indicated to increase the sinus rate and prevent further torsade. However, this makes CPVT worse. Fortunately, Torsade is more common, but if you know the patient has CPVT, avoid isoproterenol. Overdrive Pacing is listed as class IIb for incessant VT in the ACC/AHA guidelines, but this should not to be applied to CPVT. Overdrive pacing is used to prevent recurrence of pause-dependent PMVT (Torsade), which is worsened by bradycardia and improved by tachycardia). The pathophysiology of CPVT is very different from Long QT syndrome. CPVT, unlike Torsade, is worsened with tachycardia. See this post for management of Torsade. 2. AICD consideration, especially if survivor of cardiac arrest. ICD treatment without concomitant use of beta blockers is dangerous because of the risk of electrical storm induced by the adrenergic surge related to a shock. Supraventricular and ventricular arrhythmias are usually reproducibly induced by exercise stress when the heart rate reaches a threshold of 120 to 130 beats per minute. Isolated PVCs usually develop first and are followed shortly after by short runs of NSVT. If the patient continues to exercise, the duration of VT runs progressively increase and VT may become sustained. 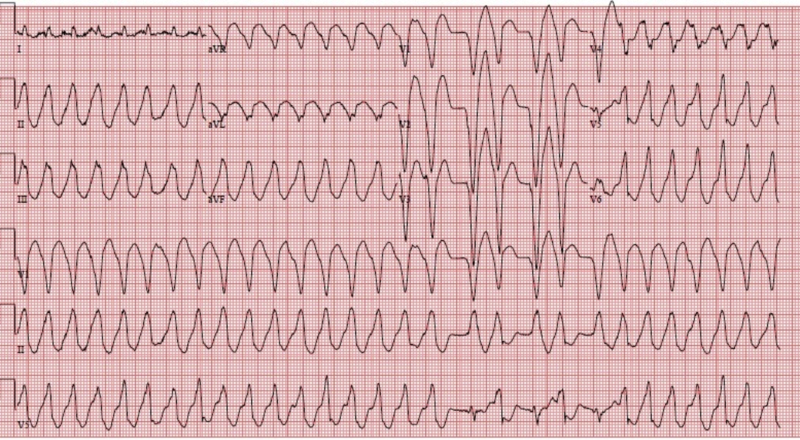 A beat-to-beat alternating QRS axis that rotates by 180°, “bidirectional VT,” is the typical pattern of CPVT-related arrhythmias. CPVT patients can also present with irregular polymorphic VT or VF. Beta blockers prevent recurrences of syncope in the majority of patients, even if VT and SVT usually can still be elicited during exercise stress test. If syncope occurs in a patient taking a beta blocker, the implantation of an ICD is recommended. However, ICD therapy requires careful programming of the device to prevent needless therapy for nonsustained episodes of ventricular tachyarrhythmia. Pflaumer A. Davis AM. Guidelines for the diagnosis and management of Catecholaminergic Polymorphic Ventricular Tachycardia. Heart, Lung, and Circulation 2012:21(2):96-100. Rosso R, et al. Calcium channel blockers and beta-blockers versus beta-blockers alone for preventing exercise-induced arrhythmias in catecholaminergic polymorphic ventricular tachycardia. Heart Rhythm 2007;4:1149–1154. Swan H, et al. Calcium channel antagonism reduces exercise-induced ventricular arrhythmias in catecholaminergic polymorphic ventricular tachycardia patients with RyR2 mutations. J Cardiovasc Electrophysiol 2005;16:162–166. This article only comments on chronic management, not acute management. Leenhardt 2012 (PMID: 23022705) reports that propafenone has also been shown to block RyR2 similar to flecainide (but only used in a single case report of resistant CPVT). They also reported that dantrolene is another possible option for resistant CPVT. They too lament the lack of therapeutic strategies, but pointed to ongoing research into RyR2 inhibitors. GREAT post on a less common but important entity. THANK YOU! This was very useful. I am a resident on cardiology. Thank you for this informational article! I actually have CPVT and have been trying to research and learn more about it myself.